We often think of computers as a very modern phenomenon, but there were actually plenty of computers around 50 years ago. They just weren’t an everyman commodity, instead limited to government and corporate use. And they certainly weren’t small. 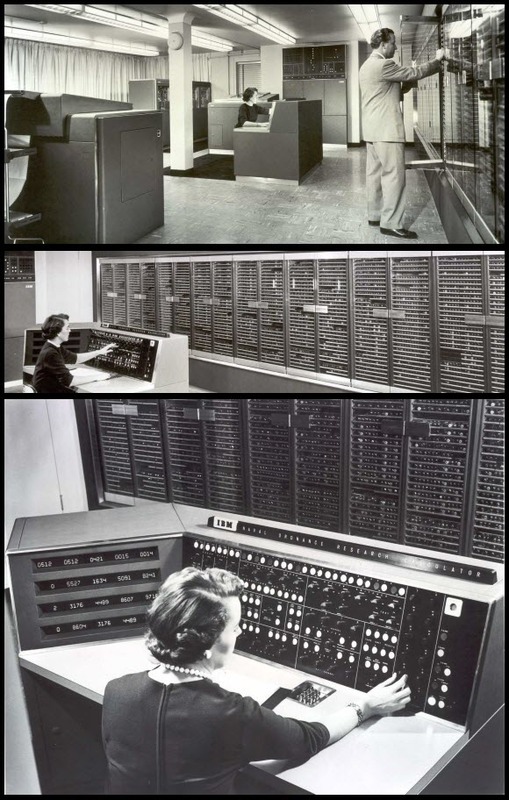 Some of them had imaginative names like Whirlwind, Colossus and Pegasus, while others were slightly less poetic with names like Z4, AN/FSQ-7, and ENIAC. Below we have listed as many as 19 examples of computers from the early days, pioneering efforts that although cutting edge in their day, now look lovingly retro. These computers didn’t use the same kind of components as we do today (not to mention software). The computers in the 1940s and 1950s were mostly based on vacuum tubes. Transistors showed up late in the game, and integrated circuits were just a distant dream and didn’t start showing up in computers until the 1960s, and then in very limited capacity. How tempting it would be to travel back in time and show the engineers of these computers a normal modern-day PC, just to see their reaction. We have listed the completion year for each computer, although work on them had often begun several years earlier (they were huge projects). We’ve arranged them in chronological order, oldest first. Please note that these are just a sample; there are plenty we didn’t include (in order to make this a blog post and not a book 🙂 ). Designed by the legendary German engineer Konrad Zuse, the Z4 was a follow-up to its pioneering predecessor, the Z3 computer he built in 1941 (the world’s first programmable, automatic computing machine). The Z4 used about 4,000 watts of power and ran at approximately 40 Hz. It had 64 32-bit registers, the equivalent of 512 bytes of memory. One addition took 0.4 seconds. Above: The Z4 computer, as seen in a German museum (in Munich). 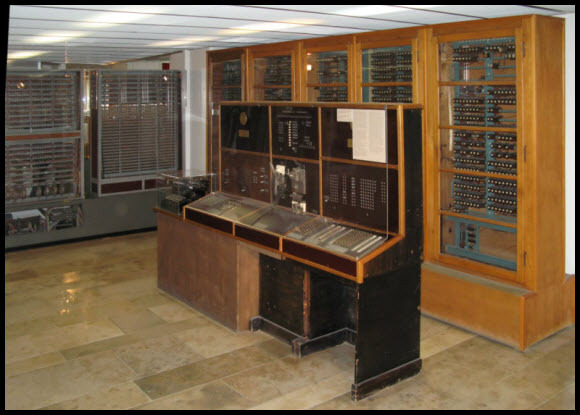 Two generations of Colossus, the Mark 1 and Mark 2, were used by British codebreakers to decrypt coded German messages at the end of WW2. It processed 5,000 characters per second (it could process faster, but then the paper tapes holding the data would break). The existence of Colossus and other British codebreaking machines remained secret until the 1970s out of fear that widespread knowledge would encourage more efficient encryption algorithms. Above, top: The Colossus in its heyday. Note the punched paper tape running on the right side. Above, bottom: A reconstructed Colossus. 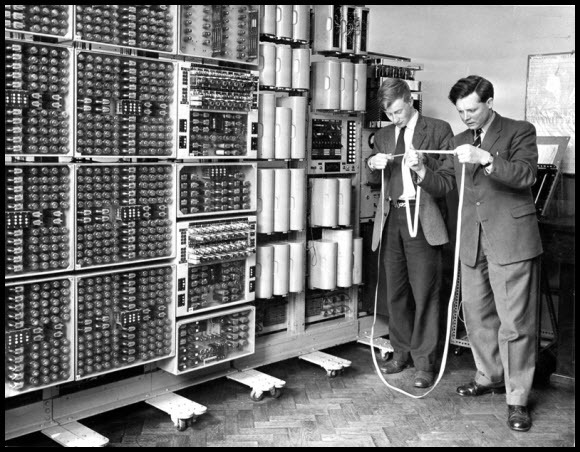 When the ENIAC was announced in 1946 the press immediately started calling it a “Giant Brain”. ENIAC was the world’s first general-purpose electronic, digital computer and is probably the most famous of the ones included in this article. It weighed 27 tons. 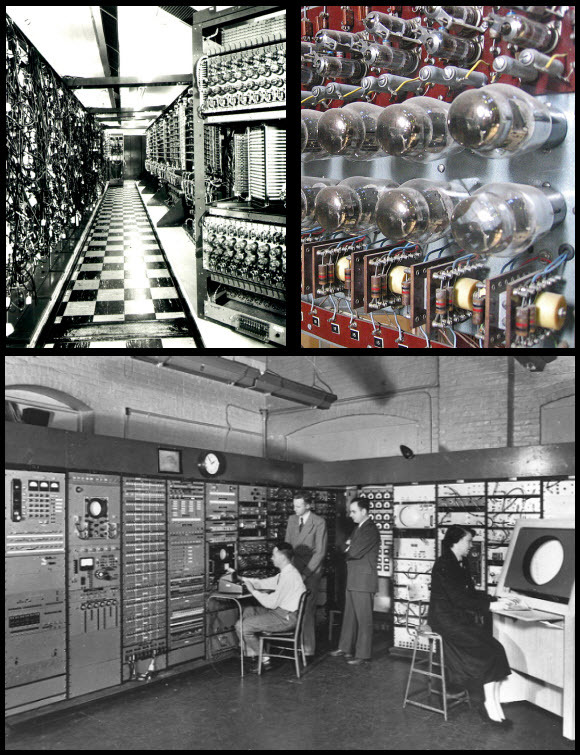 Among other things, ENIAC was used for calculations to create the hydrogen bomb. Programming the machine could take weeks, since after the program had been figured out on paper you first had to manipulate the various switches and cables that controlled the programming and then follow that with verification and debugging. Above, top: The ENIAC in all its glory. Above, bottom: Old-school programming? 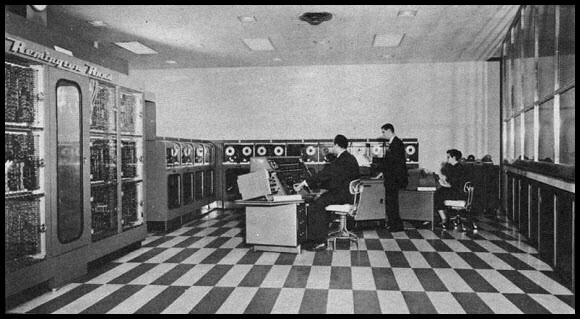 The Whirlwind was the first computer to use video displays for output. The first version had 512 bytes of main memory and could do 20,000 instructions per second, although a switch to a different kind of memory later doubled its performance and made it the fastest computer of its time. Above, top left: The Whirlwind. Above, top right: Closeup of the circuitry. Above, bottom: The control room. An acronym for UNIVersal Automatic Computer, the UNIVAC I was the first US-produced commercial computer. It was designed by the inventors of the ENIAC. A total of 46 systems were built and delivered. It weighed 13 tons (29,000 pounds), ran at 2.25 MHz and could perform 1,905 instructions per second. The UNIVAC I cost up to $1.5 million per system. 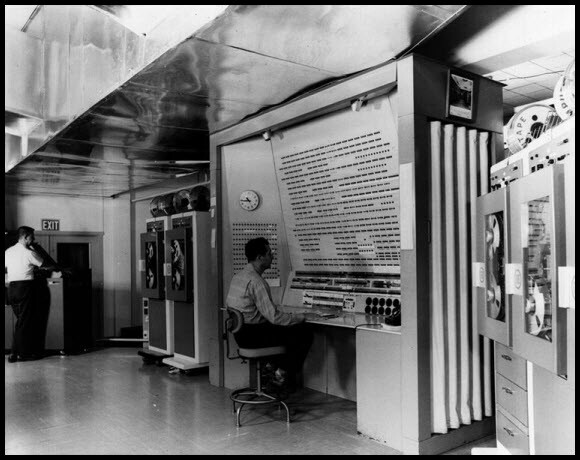 Above: The UNIVAC I, built by Remington Rand (see their nifty logo top left in the image). Short for the Wolverhampton Instrument for Teaching Computing from Harwell, the WITCH was also known as The Harwell Dekatron Computer. It was slow (a multiplication took 5-10 seconds), but this was justified by its ability to run long periods of time unattended. It could therefore be left on its own with a large amount of input data. At one point it was left running over the Christmas and New Year holiday and was still working when the staff came back 10 days later. Above: The WITCH in use. Is it just us, or do they look a bit confused? Pingdom being Swedish in origin, we had to include this Swedish computer from 1953. BESK stands for Binär Elektronisk SekvensKalkylator, which is Swedish for Binary Electronic Sequence Calculator. The main memory was 512 40-bit words, the equivalent of 2,560 byte. An addition could be performed in 56 microseconds, and a multiplication in 350 microseconds. For a short time, it was the world’s fastest computer. Small aside, “besk” means “bitter” (as in taste) in Swedish, but besk is also an alcoholic beverage from the south of Sweden. The name was a pun sneaked in by the computer’s creator, who had previously had the computer name COGNAC rejected by officials. Above: The control panel for the Swedish BESK computer. 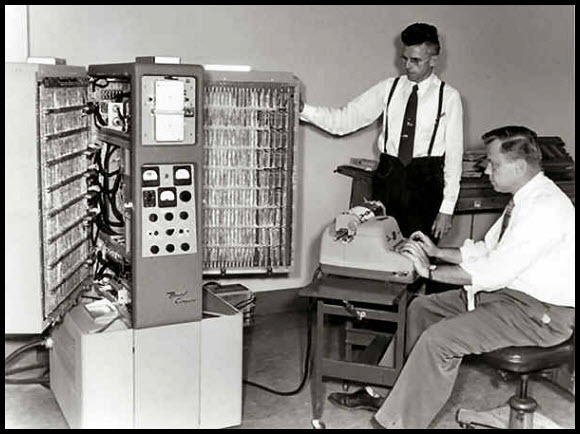 The IBM 702 had been announced as early as 1953, but the first production model wasn’t installed until 1955. It was a commercial computer that could be leased from IBM. The system could have a maximum of 11,000 7-bit characters of main memory, i.e., roughly 10 kilobytes. It could do 3,950 additions or subtractions per second, but multiplication and division were significantly slower. Above: An IBM 702 installation. 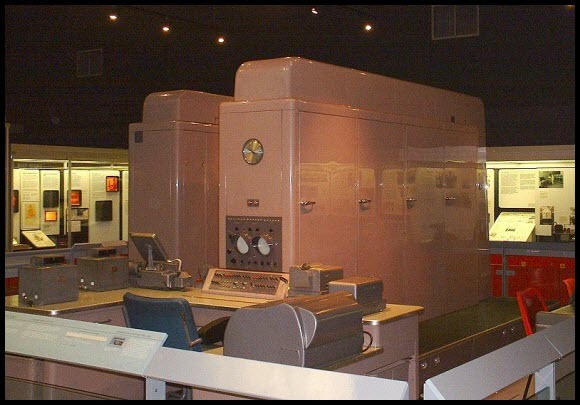 The IBM Naval Ordnance Research Calculator was arguably the first supercomputer and was the most powerful computer of its time. It could perform 15,000 operations per second, and the first version had 2,000 64-bit words of main memory, roughly the equivalent of 16 kilobytes. 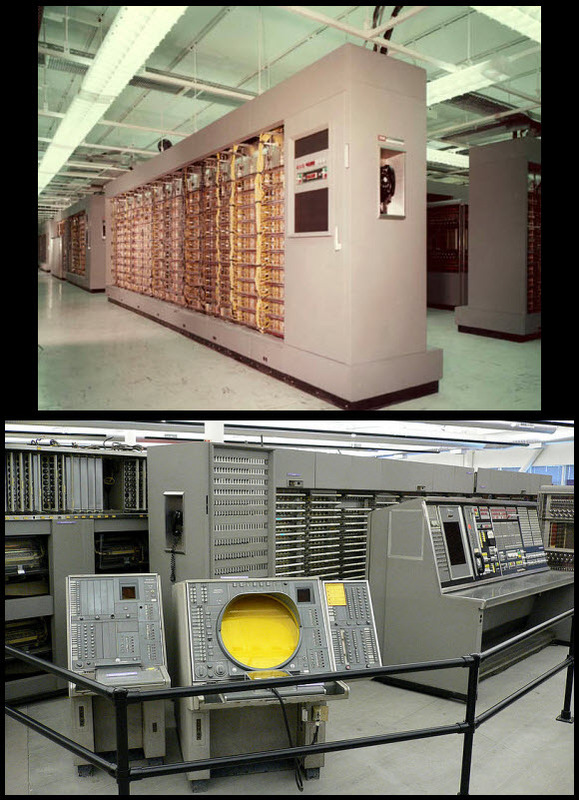 Above: Various angles of the IBM NORC. The Bendix G-15 weighed 450 kg (950 lb) and cost around $60,000. It had 2,160 29-bit words of memory, the equivalent of about 7.6 kilobyte. The G-15 has sometimes been called the first personal computer, although there are disagreements about this. More than 400 were made. Above: The Bendix G-15. It looks like a very big tower desktop computer. Kind of. The British computer Ferranti Pegasus was designed and built to be cheap and reliable. It had 5,120 40-bit words of memory, the equivalent of 25 kilobyte, plus 56 words (280 byte) of fast memory. A Pegasus 2 from 1959 is still operational at the Science Museum in London. It is the world’s oldest working digital computer. Above: A Pegasus 2 at the Science Museum in London. The cabinet was built by Rolls Royce, hence the use of car door handles for the doors. Note also the inserted clock at the short end. A successor to the Whirlwind, based largely on the design of the never-realized the AN/FSQ-7 was developed by IBM in collaboration with the US Air Force to be used with the SAGE air defense system. It is sometimes incorrectly referred to as the Whirlwind II. One computer took up 2,000 sqm of floor space (roughly half an acre) and weighed 275 tons. They are the largest computers ever built (52 of them were made). The AN/FSQ-7 could perform about 75,000 instructions per second. Above, top: An installation of the AN/FSQ-7. Each cabinet a built-in phone to save time when calling in problems (seen here at the short end of the nearest cabinet). Above, bottom: SAGE control consoles. A sign of different times: each console had a built-in cigarette lighter and ashtray. 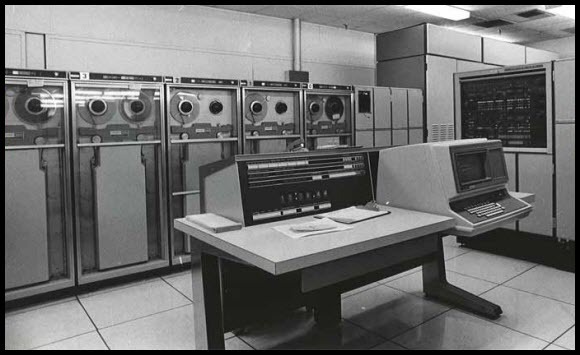 A typical IBM 7090 system cost $2.9 million and was designed for large-scale scientific and technological applications. Among other things, it was used by NASA to control space flights. A 7090 system is featured in the movie Dr. Strangelove. 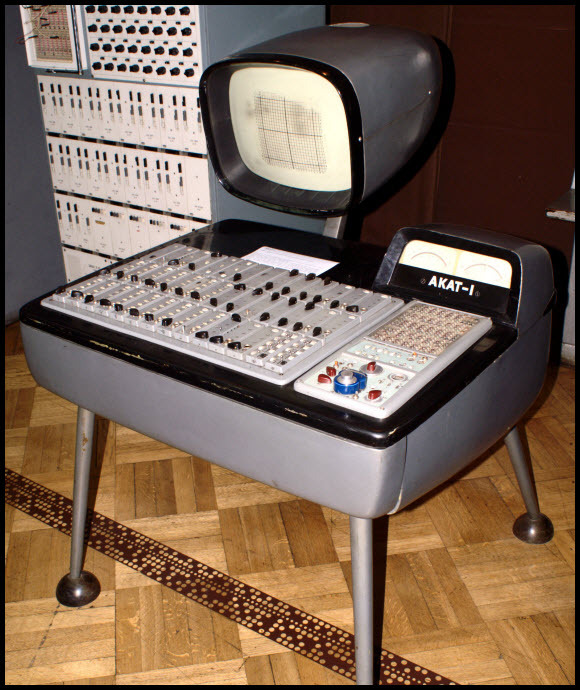 In 1961, a later version, the 7094, became the first computer ever to sing (the song “Daisy Bell”). This was the inspiration for a scene in 2001: A Space Odyssey. Above:The IBM 7090. Trivia: The second man on the left is Smith DeFrance, founding director of the NASA Ames Research Center. 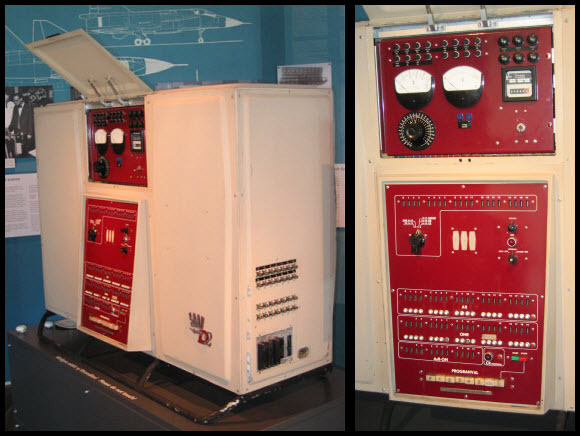 The Polish AKAT-1 was the world’s first transistor-based differential analyzer, designed specifically to solve systems of differential equations. It was never mass produced due to the country’s policies at that time. Never massproduced, the Datasaab D2 was a concept computer build in Sweden. It weighed “only” 200 kg and could be placed on a desktop. It held the equivalent of 15 kilobyte of memory and could perform 100,000 additions per second. It was a prototype designed to test the feasibility of computerized navigation aid in aircraft. Datasaab was the computer division of the aircraft manufacturer Saab, which made fighter jets for Sweden. Above left: The Datasaab D2 in its entirety. Above right: Closeup of its control panel. The name BRLESC is an acronym for Ballistic Research Laboratories Electronic Scientific Computer. It was, as its name suggest, designed primarily for scientific and military tasks. It could do five million operations per second and had 4096 72-bit words of memory, the equivalent of 36 kilobyte. Above: The awesome-looking console for the BRLESC I computer. 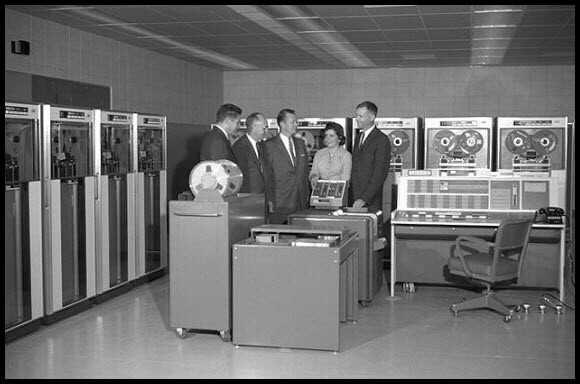 The Honeywell 200 and its successors were introduced to compete with affordable commercial computers from IBM (specifically the IBM 1401). The native assembly language used to program the Honeywell computer was named Easycoder. Yes, at that time, assembly language was considered easy to code in. Honeywell ran an ad campaign over several years that they called the Liberator, using various very creative sculptures made from computer parts (one example available here). Above: The H200 at work. The transistor-based UNIVAC 1108 supported up to three CPUs and up to 262,144 36-bit words of memory (more than 1 MB). The memory used integrated circuits (quite rare at the time) instead of the thin film core memory used in its predecessor, the 1107. Above: A later model of the 1108 from 1969. As you can see from some of the examples above, acronyms were highly popular. Some scientists were so fed up with this acronym mania that they started mocking it. There was for example a computer called MANIAC (I and II), which stood for Mathematical Analyzer, Numerical Integrator, and Computer. It’s fascinating to look back and see how things were in the early days of computing, and it truly illuminates how far we have come. Today we have more computing power in our pocket than what would fit in entire buildings in the past. Our most modest smartphones widely exceed the performance and storage capacity of these early behemoths. Looking for more articles on the history of IT? Check out the list of 10 historical software bugs (with extreme consequences) and our guide on the history of computer date storage. Data sources: Almost needless to say, Wikipedia was an invaluable starting point when researching this post, which in turn uses a ton of other places as data sources. Too many to mention here. 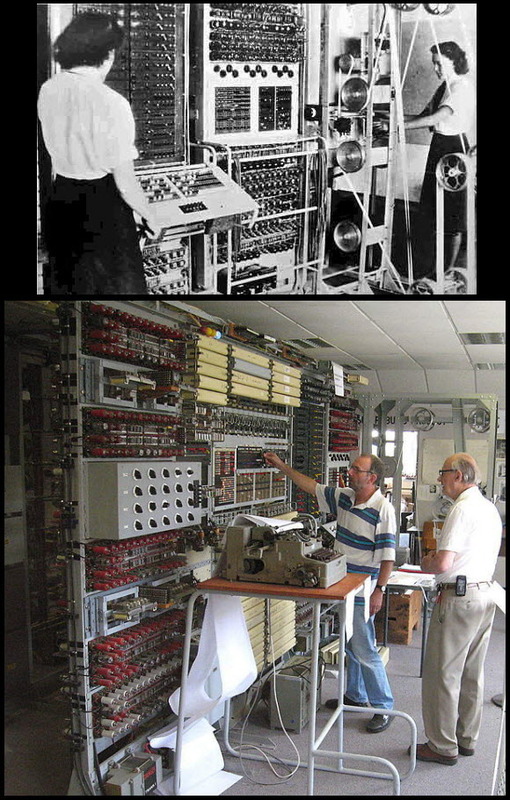 Image sources: Z4 by Clemens Pfeiffer; Colossus old image by UK government, rebuild image by MaltaGC; ENIAC images are from the US Army; Whirlwind top left from Computerhistory.org, circuitry by Dpbsmith, control room from MIT; UNIVAC I from US Army; WITCH from the Computer Conservation Society; BESK by Liftarn, IBM 702 from the US Federal Government;IBM NORC images from Columbia University; IBM 305 RAMAC from the US Federal Government; Bendix G-15 by unknown author (stored by Wikipedia); Pegasus; AN/FSQ-7 from US Air Force, SAGE consoles by Steve Jurvetson; IBM 7090 by NASA; AKAT-1 by Topory; Datasaab D2 images by Lars Aronsson; BRLESC I from US Army; Honeywell 200 image from unknown source; UNIVAC 1108 by the manufacturer. 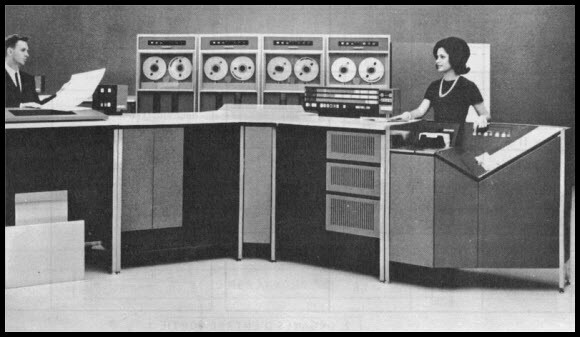 I’m very surprised that your survey of significant systems implemented in the ’40s to ’60s time frame omitted the arguably longest surviving one of all: The IBM S/360 – the first system designed to run both COBOL and FORTRAN applications, with binary application compatibility with IBM System z in the 21st Century. Your statement about PEGASUS being the world’s oldest working digital computer is wrong. The Z4at the German museum in Munich is still working. If you ask the guards nicely, they will give you a demonstration of the machine computing square roots of integers using newtons algorithm. Great to see the Video Terminal on the UNIVAC 1108. I think I will now have to arrange a trip to the science museum in London to see a working Pegasus. There is one very surprising omission from your otherwise excellent list: the Leo, the world’s first office computer (1949 onwards). The last Leo wasn’t decommissioned until the early 1970s, making it possibly also the world’s longest-lived production system. Peter Flynn: The longest-running production systems ran for 50 years in air-traffic control. They were manufactured by IBM. 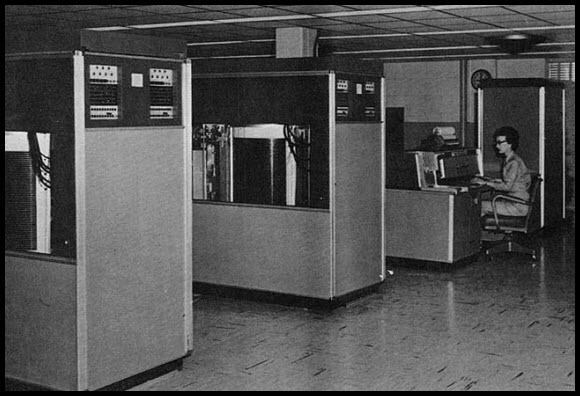 In 1967, IBM delivered the first of more capable systems. Some of these were used for forty years. I’m sorry, I can’t remember nor find the model numbers. 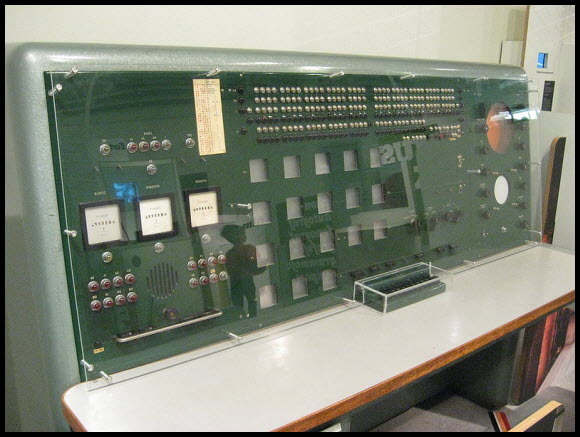 Notable omission of the Atanasoff-Berry computer, as it pioneered binary electronic computation and regenerative magnetic memory. The patents on ENIAC were much laterinvalidated as derivative of the ABC. 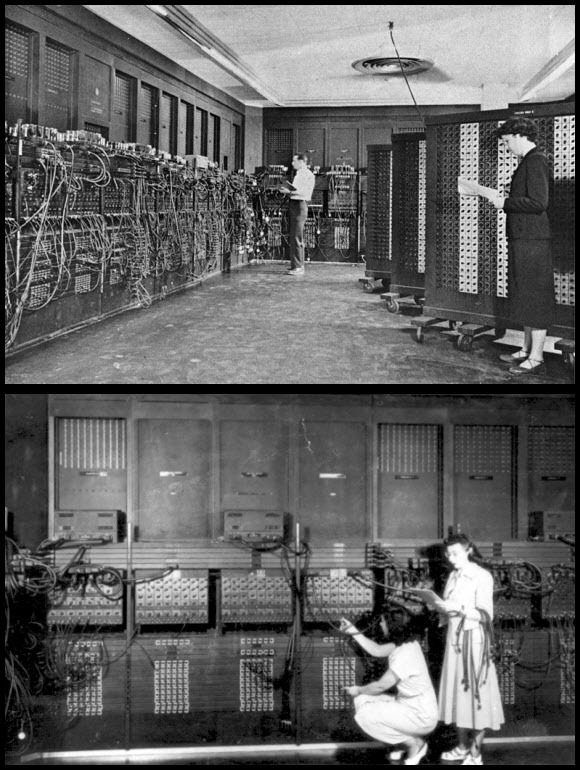 Although, ENIAC can be considered more influential due to it’s programmable nature. Great list. Read it all. Since you’re mentioning Swedish stuff, please dont forget your neighbors 🙂 (the Danes, you know). The Danish DASK was put into production in 1958 after two years of work. The lead engineer had been following the Swedish BESK project before taking on the DASK-challenge. DASK has a hidden meaning in its name – like “besk” – since “dask” (in Danish) can be roughly translated to hitting someone/something, although not very hard. Lest we forget, RCA manufactured and sold some really cool computers. Yes it is a great list. As a former employee of RCA, I vividly remember the RCA computers. Learning to program the 501 changed the course of my life. Visits to Fort Meade and the Naval Bureau of Weapons were like trips to the temple. What magical monsters they were. RCA models I can remember were 501, 301, 3301, 70/45 (they came in several sizes) and they were working on a “real time” version of the 70/45 by 1968. Seems it had a high speed drum to facilitate rapid access to the data. RCA also had a few mass storage devices that deserve mention. They had a RACE unit that held magnetic cards, 256 to a magazine with 8 magazines. These cards were selected from the magazine and fed to a raceway that led to a drum where it was wrapped and held for the read/write heads. I also remember a framed piece of a disk platter that had disintegrated from centrifugal force, penetrated the cabinet and broke a co-workers leg. to see the brochure on the RCA 501. The Z4 does not have 512 bytes, it is 256 bytes. The photos are phenomenal…. Very colorful, all set up!!! Great lineup. Especially liked that Polish calculator the AKAT … the whimsical design playing off UFOs is wow. The one thing I’d have like to see is a couple more *analog* computers. Don’t see them much, but there were some. I’d get into it with y’all but then I remembered, The only winning move is not to play. Awesome, it’s amazing to see the changes in computing and technology over the past 50 years or so. What Amazes me about the Pegasus is that if they wanted it Built cheaply then why did they ask Rolls Royce to Build the Cabinet ? What? No IBM 7080? I see you have a 7090 thare but where’s the 7080? I started my IT career as a Peripheral Equipment Operator on that beast. Also I am suprised the ubiquitous IBM 360 isn’t there. Ah the sound of the Selectric Ball Typewiter for entering operator commands and binary light system status displays. The information is great, but from the responses I se some updates should be made. However for me it was an eye-opener because my IT-career started as prgrammer of the IBM 360-40. Of course I had heard of and seen the IBM 1401 and some of its predecessors. Also the I had heard of the very early the Philips computer the X1 which I have missed in the list. In your list of old-time computers I miss the IBM 705 Data Processing Machine. The company I was employed with installed one in 1957 (the only one in Germany) that was in operation up to 1669/70! This model was one of 6 or 7 in Europe, Middle East and Africa. Overmore there were in operation several IBM 1401, IBM 1410 and IBM 7010 in Germany.